I’ll be blunt. Never have I had so much trouble getting a smart home product to work. In fact, Wink Lookout is so difficult to get up and running—and so frustrating in actual operation—that shoppers should categorically look elsewhere for their home security needs. 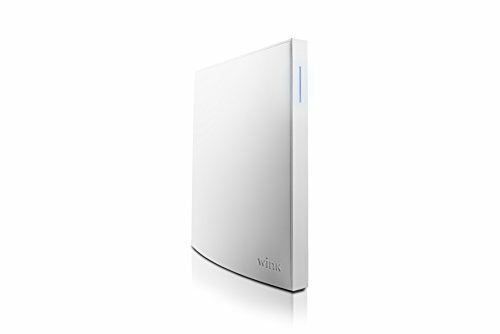 This may come as a surprise, because the Wink Hub 2 is one of our most highly recommended smart home control systems, and that recommendation remains intact. But in July, Wink was acquired by i.am+ (the tech company owned by musician Will.i.am), and things appear to be in flux. The biggest news since that acquisition is the launch of Wink Lookout, Wink’s belated passel of security sensors designed to integrate with the Wink Hub ecosystem. I recommend you avoid them. The Lookout hardware—that’s the motion sensor on the left, and one of the door/window sensors on the righ—is small in size, but build quality isn’t the best. Wink Lookout isn’t a single product but a collection of products bundled together. They include a standard Wink Hub 2, two door/window sensors, a motion sensor, and a siren. All these devices are designed to work together in conjunction with the standard Wink app. Once set up, you’ll find a new icon within the app, called Lookout. But first, let’s talk about that setup. Once you have a Hub installed and the Wink app configured, it’s time to start adding sensors. Ostensibly, this is done within the Wink app, by telling the app you’re adding a product, identifying the type of product, then simply pulling out the plastic tab that engages the battery. If all’s working well, the app and Hub will find the sensor, adding it to your Wink ecosystem. Unfortunately, with all four of the Lookout products in the package, none of these joined the network as expected. This new section, built into the Wink app, gives you alert status at a glance. 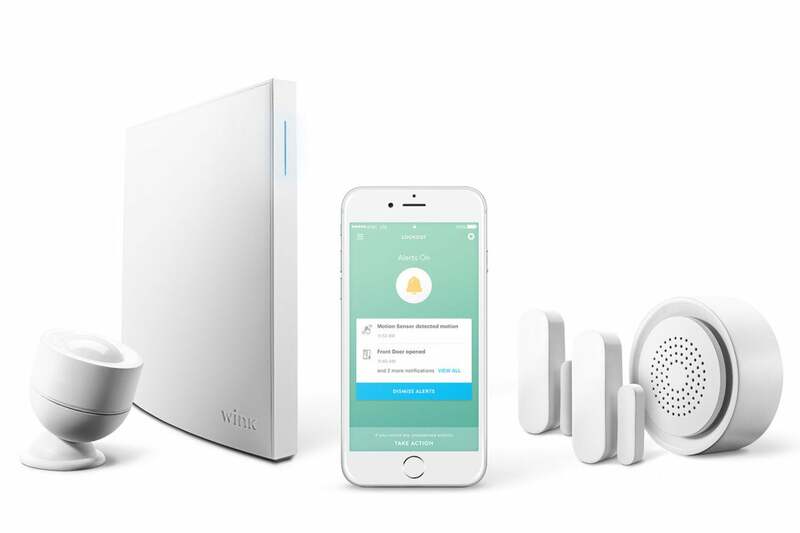 It’s not unusual for a smart home product to fail to connect the first time, and Wink outlines steps to reset the product and try again directly within the app. In every case, I spent considerable time continually resetting and attempting again to pair the sensor to the Wink Hub, literally spending nearly a week before I got all four sensors successfully connected. This sad situation alone merits a strong “avoid” recommendation. Once connected, my troubles continued, albeit on a less significant scale. Getting the door sensors (which feel awfully cheap in construction) correctly positioned required considerable tinkering, but eventually I was able to get them going. I had less trouble with the motion sensor, which is hyper-sensitive and boasts a sensor with a very wide range of motion detection. The motion sensor, which attaches magnetically to its base, allowing for creative positioning, emits a blue light from the sensor whenever motion is detected. This is a significant distraction that, perhaps importantly, alerts anyone in the room that a motion sensor has spotted them. This light can’t be disabled. 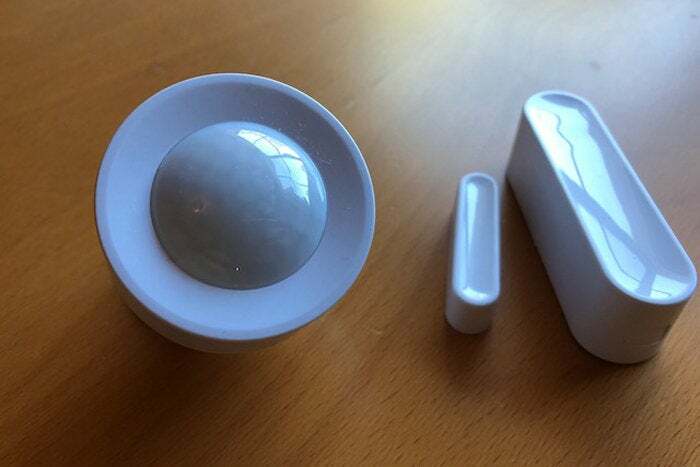 These sensors are intended to connect to Wink’s siren/chime unit, a small hockey puck that is meant to work as a chime when a door or window opens, or as a siren if you configure Lookout to work as an alarm. Setting this up is a bit of a pain, involving delving into Wink’s IFTTT-like “robots” system. Chimes and sirens must be configured piecemeal for each sensor, a painstaking process that requires considerable patience and attention to detail. The Wink app itself is easier to work with, though it lacks any degree of flexibility. 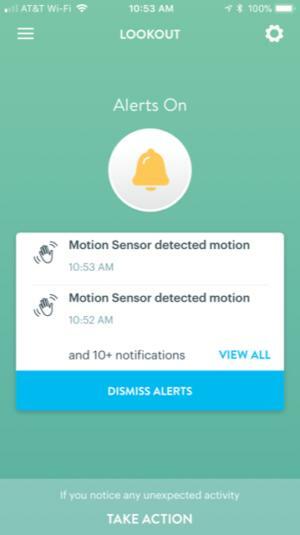 The app is designed to send a push notification to your phone every time motion is detected or when a door is opened or closed—and I mean every time. There is no way to set the sensitivity of the motion sensor, nor any way to set any kind of delay to prevent alerts from piling up in quick succession. The upshot is that if the sensor finds itself in a busy room, you will quickly be inundated with motion alerts arriving every 15 to 20 seconds. As there’s no way to disable these alerts without turning the system off manually altogether, you can easily receive hundreds in the course of a day—though you can fortunately configure the siren/chime to engage only during certain hours, allowing it to work as a rudimentary nighttime-only alarm system. All told, this $199 package isn’t just difficult to get up and running, its functionality is simply too limited to merit serious consideration. Plenty of security-focused alternatives abound; better to investigate those options instead. Wink Lookout is unfortunately much too basic—and too difficult to set up—to merit purchasing.